I was recently asked by a long time Port Hardy resident if I could find any information about the wreck in Fisherman Bay, which is a small bay on the side of Nissen Bight, at Cape Scott. An old wooden wreck has sat on the beach for almost 80 years. I have been asked if it was associated with the early Cape Scott settlement in the late 1800s, or perhaps with the radar station which stood near the lighthouse during World War II. Other people have asked if the ship was a victim of storms in the area. 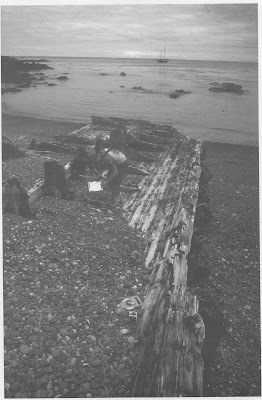 I was able to locate some documentation about the wreck in the book "Historic Shipwrecks of Northeastern Vancouver Island" put out by the Underwater Archaeological Society of BC (UASBC). As a part of an initiative to catalogue wrecks around BC, the UASBC enlisted the help of a reporter at the Times Colonist, Patrick Murphy, to try to find out about where this particular ship came from. Together they were successful in uncovering some of its interesting history. The information in this article is taken from this informative book, which is available through the Vancouver Island Regional Library. 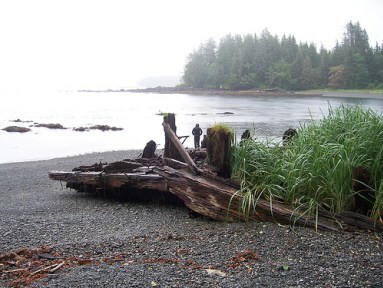 The wreck on the beach at Fisherman's Cove is what little remains of the Pelican 1, previously known as the Oregon. In 1917 this wooden vessel was commissioned under the name MV State of Oregon and it was first launched in Seattle by the Alaska Pacific Construction Company under the name Oregon. The boat originally measured 215 feet in length and was one of the first diesel powered ships. The Oregon enjoyed about 20 years of working life on the Pacific coast. She was a freighter, primarily used to transport goods between Washington and Alaska. The Oregon in its finer days. By 1936 she was deemed to no longer be seaworthy. Her engines were taken out and the freighter became a barge in 1939. In the early 1940s her name was changed to the Pelican 1. On August 24, 1945 a resident of Victoria, Bill Dixon, incorporated the Fisherman Bay Limited company, capitalized at $100,000. Dixon had the idea to provide services to the commercial fishing fleet out of Cape Scott at Fisherman Bay on the North end of Vancouver Island. Unfortunately, the harsh seas off Cape Scott did not provide any protected harbour in the immediate area, and so Dixon attempted to convince the government to fund a breakwater. When the government wasn't receptive to his proposal, Dixon purchased the old shell of the Pelican 1 for $900 in July 1946. He filled it with gravel, brought it to the entrance to Fisherman Bay and blew holes in the hull with dynamite. The ship sank, but did not hold its location. By October of 1946 it had drifted onto the beach, and was left there to rot. Dixon disappeared and his shareholders were left trying to decide what to do about the company. Surveying the wreck - June 1995. Photo courtesy of J. Marc of the UASBC. 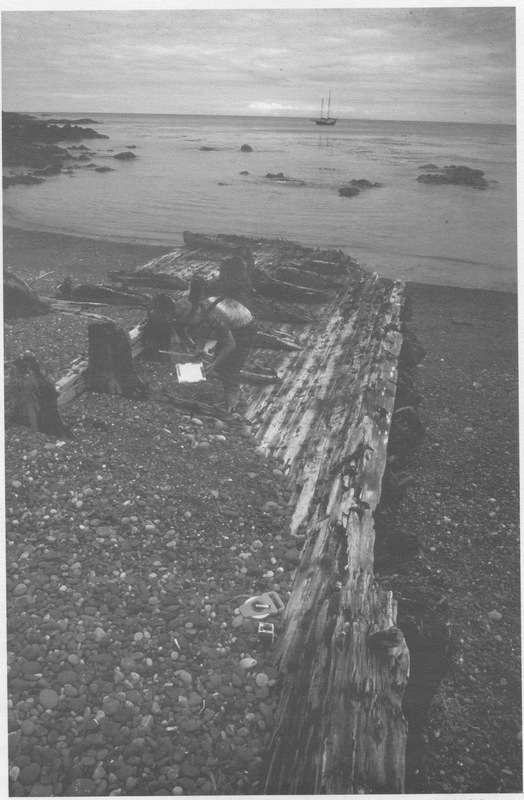 The UASBC visited the wreck (at that time of unknown providence) in 1995 and catalogued what remained on the beach and in the nearby water. At the time there were still a number of pieces of the wreck on the bottom of the Bay. The wreck is one of a number of interesting artifacts in Cape Scott Provincial Park that give a glimpse into the many attempts to live and do business in the remote and harsh environment at the northern tip of Vancouver Island. Straight from the archives - this amazing footage was taken in the 1920s, when the main community of Port Hardy was located on the south-east side of the bay. At this time the newer community of Hardy Bay, located at the present townsite, was just starting to grow. The short film provides a panorama of the community and the bay, as well as a brief glimpse at the clothing worn at the time as a couple of men walk by the camera as the panorama is being filmed!